When you consider that Jeep is the most important and valuable brand that Fiat Chrysler has to offer, it starts to make sense that FCA would attempt to Jeepify everything else in its portfolio. 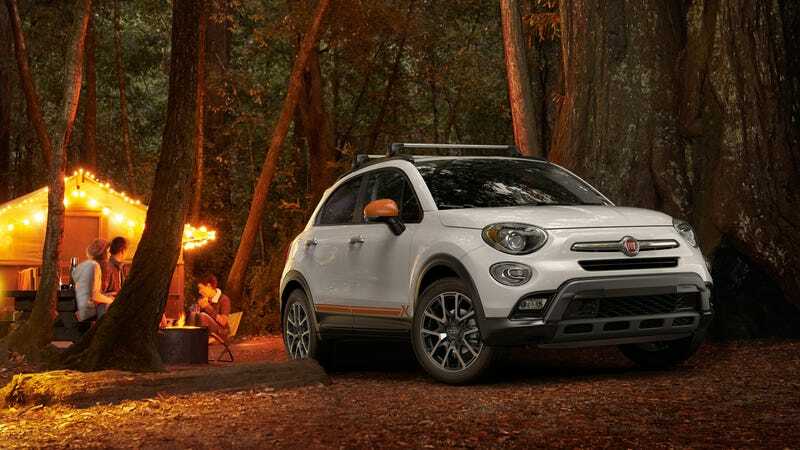 Including the Fiat 500X, which already shares its platform with the Jeep Renegade. Let us not get bogged down by details! This is the new Fiat 500X Adventurer Edition, a $945 package that’ll make your Fiat 500X more rugged with 18-inch wheels, black roof rails, orange mirror caps and body graphics, cross bows, splash guards, a molded rear cargo tray and front and rear slush mats inside for the mud and muck you’ll trek into your car. You can get it four colors: white, black, gray and metallic gray. Inside, you can choose either black or brown. Not white, though, because everyone knows that a white interior and aggressive outdoorsing do not mix. With last month’s report that said that FCA will supposedly cut down on small cars like the Fiats and go big on Jeeps, this could be one of the automaker’s dwindling attempts to woo buyers. The Fiat 500X’s sales numbers kind of sucked in 2017, a year when car buying was on the rise. FCA only managed to move 7,665 500Xs, according to Good Car Bad Car. By comparison, Jeep sold a hilarious 103,434 Renegades last year. After seeing those abysmal figures, I sorta don’t blame them for trying to get buyers to rough it with the 500X.